This cupid game will challenge your hand and eye coordination as you'll control a ball to jump over obstacles and move from platform to platform. It's a fast-moving game and you'll need to be even quicker in order to be the top scorer! Spinning hearts are your friends (collect those to earn points). Everything else is an obstacle! 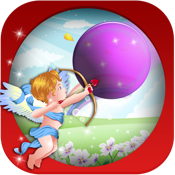 How To Play "Red Pink and Cupid:"
When you see "Get Ready," tap your screen to begin the game. The ball will begin rolling across the platform and will run over everything in its path. Tap the screen above the moving ball in order to jump over obstacles and jump to higher platforms. Avoid roses, cupid, red platform boxes and other Valentine obstacles. The only items you should "collect" are red spinning hearts. When you complete a level, you'll get a much-needed break. Then, tap the "Level Completed" screen to start the next level. In some levels, you'll go backwards, so watch out! - Clever and fast game play. - Great for hand and eye coordination. - Fun music during game. - Valentine's Day obstacles and collectables. - "Remove Ads" paid feature is also available.